The VersaProbe station from Physical Electronics (PHI) is a unique scanning X-ray monochromator XPS instrument that provides outstanding micro-spectroscopy analytical performance. The PHI VersaProbe is capable of detailed elemental and chemical analysis using X-ray Photoelectron Spectroscopy (XPS), also commonly known as Electron Spectroscopy for Chemical Analysis (ESCA). It is also designed for rapid, spatially resolved analysis of solid surfaces. The VersaProbe combines a unique monochromatic X-ray probe with automated sample handling and analysis area identification tools to give true chemical state imaging and multi-point spectroscopy in an automated environment. XPS scan on Acrylic coated Aluminium revealing the chemical composition of the coating. 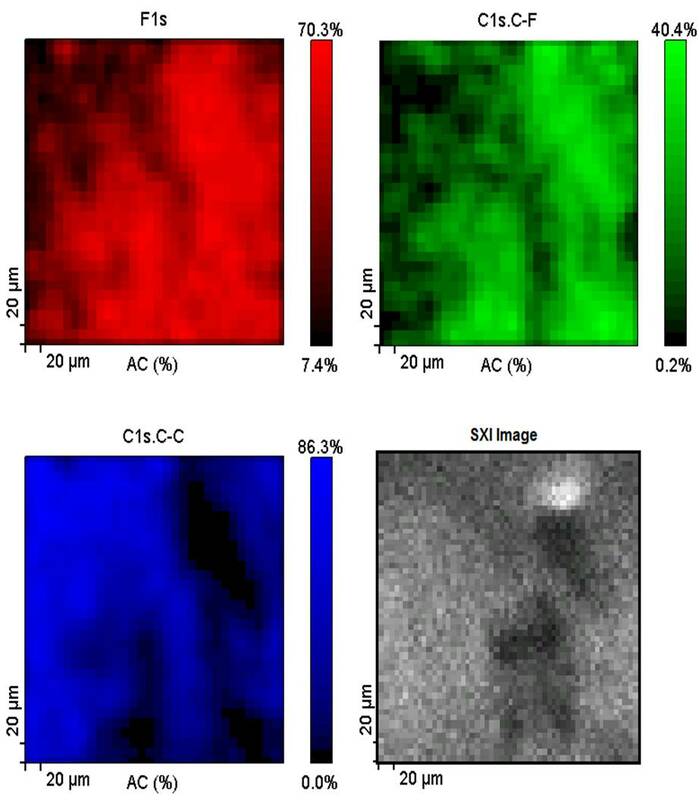 Description: XPS Spectral Maps of Fluorine 1s and Carbon 1s atomic concentration (AC%) from a PTFE defect region on Steel substrate, as shown in the secondary x-ray image (SXI). The C1s has been separated by peak fitting into the signal arising from fluorinated carbons (green) and hydrocarbons (blue). The ratio of C1s.C-F to F1s in the region of the defect is approximately 1:2, as expected for PTFE. Away from the defect, the hydrocarbon contamination of the steel dominates the composition.